Have you ever wanted to know when your favourite author will be bringing out a new book? Have you ever wanted to know when your favourite author will be bringing out a new book? Or if you’ve missed reading any of the books in a series? Or maybe you just want to find something new to read. If any of this sounds like you, the Fantastic Fiction website might make your day! I’ve been using Fantastic Fiction for years now. It’s bookmarked and on my Favourites Bar, and I probably dip into it at least once a week. Of course, there are hundreds of websites out there, many of which specialise in crime fiction (which is what I read). But as far as I’m concerned Fantastic Fiction is the best. In these days of information-overload it’s a treat to land on a website that’s simply designed and does-what-it-says-on-the-tin. From my point of view Fantastic Fiction is organised logically, which makes it easy to search and navigate. And that logic extends to every page you visit. 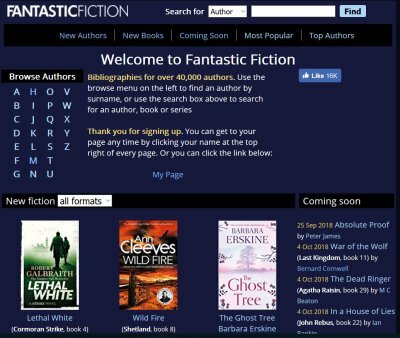 I’ve never been quick off the mark with technology and despite using Fantastic Fiction (FF) as a reference source for years I’ve only recently realised you can sign up and make the website work even better for you. How could I have missed this? Registering allows you to use FF to help you manage your book list. You can keep a list of your favourite authors, create a Wish List of books you want to read, and make lists of the books you’ve already read. Using this information, FF will compile a list of book recommendations tailored to your reading habits. I haven’t had time yet to get my page organised but it all looks good! Don’t be daunted when you land on the home page and see that FF has bibliographies for over 400,000 authors. You can browse the site in so many different ways. For starters, the main Search facility allows you to search by Author, Book or Series. Then there are tabs for New Authors, New Books, Coming Soon, Most Popular and Top Authors. Click through to any of these pages and there’s another search facility where you can choose format, genre and publication date to drill down to the authors and books that will interest you. The authors’ pages on FF are brilliant too. Every author has their own page which gives a bit of information about them and shows their New Books. Below that are listed the books they’ve published with a thumbnail photo of the covers; and If they’ve written a series (or several series) the books are listed in sequence with the publication date. It’s like having an online library bookshelf, with everything in the right place. Want to know more about a particular book? Click on the title and you’re taken to its page where you can read the cover notes, read a preview and see what formats it’s available in. Further clicks will take you to Amazon etc if you want to purchase. You’ll also find links to the authors’ own websites. And if this hasn’t got you interested in Fantastic Fiction, I think a stand-out feature is the Author Recommendations. Scroll down to the very bottom of an Author’s page and you’ll find a list of books they’ve enjoyed reading themselves. OK, I know it might actually have been compiled by a publisher or a PR person, but the lists always seem wide-ranging and, over the years, they’ve helped me discover so many new authors that I’m determined not to be cynical. So there you have it. This is a website that’s well designed, easy to use and is a genuine game-changer if you’re a keen reader and want to find books and authors quickly. If you haven’t already discovered Fantastic Fiction give it a try. I bet you’ll get hooked like I did!